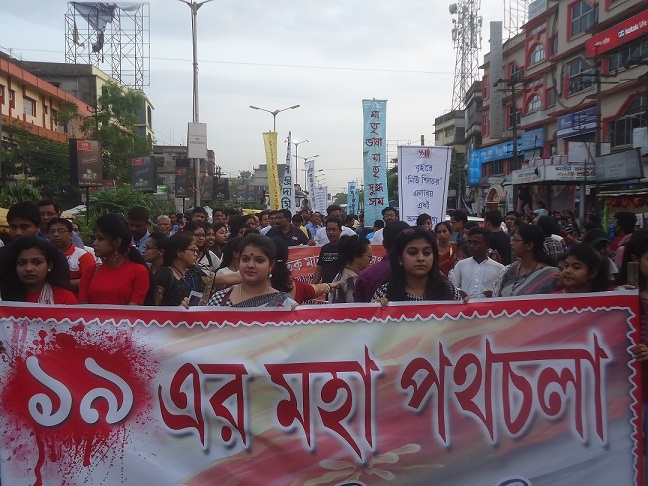 As previous years, to recall the sacrifice of 11 martyrs on May 19 in 1961, this year also, people of Barak Valley are gearing up to observe the day as ‘Unishe May’ all over the Valley including Silchar. A number of programmes have been lined up to be organised in the Barak Valley on May 19. The central theme of the series of the programmes has been named as ‘Hridaye Rabindranath, Chetanay Unish’. The programme will start on May 6 and continue till May 27. On May 17, a grand walking – Unisher Maha Pothchola – passed through the main roads of Silchar town. Cultural programmes scheduled to be held at Gandhi Bhawan on Saturday will be dedicated to great poets Kazi Nazrul and Sukanta Bhattacharjee. A huge rally (Provaat Ferry) will be taken out on Saturday. After that eleven martyrs of Barak valley will be garlanded by the masses at the Smashan Ghat. On May 19, 1961, a total of 11 youths sacrificed their lives in front of the bullets of police. They were killed during a peaceful agitation organised in the Silchar Railway Station for their mother tongue Bengali. From then, they are popularly known as ‘Ekadash Shahid’ or the ‘Eleven Martyrs of Barak’.